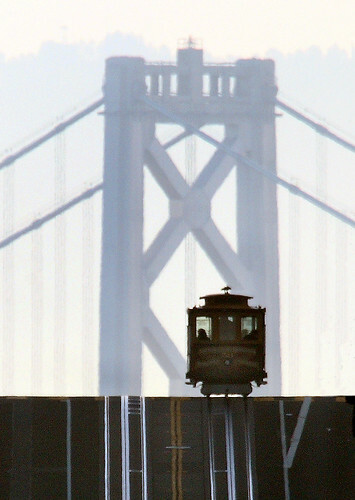 Cable Car and Bay Bridge, originally uploaded by Wiggum03. "Well, it took me a while but I finally figured this one out… I saw a version of this shot about a month ago and wanted to get my own, so I headed over to California Street one morning and looked all along the cable car line for this view. No luck – there didn’t seem to be a spot where the cable car rose right up like that with the Bay Bridge in the background. I even tried reviewing a map of the cable car system to see where this view might be. Still no luck. It didn’t dawn on me until this past Sunday that I probably had the right idea, I just didn’t have the right angle. So I went back to California Street, stood on that hill by the Mark Hopkins hotel and drew an imaginary line from the Bay Bridge tower, through the spot I was standing on, all the way back until it hit the spot where I’d have to be to take this photo: the top of the hill at California and Gough. The catch is that the place where you can take this photo is a long, long way off. So I had to use a serious telephoto lens (400mm + 1.4x extender) and heavily crop the image. It was taken from far enough away that you can really see the atmospheric distortion. To further complicate things the best place to stand to take this shot is in the middle of the road, so you have to time the cable car cresting the hill with a red light on California Street. Glad to finally get this one."